The last few weeks have been busy. Printing work for a show in Japan. Discovering that I was going to a residency in Vermont…last minute…due to my teaching schedule and the other Ohio artist being unavailable to take advantage of an Ohio Arts Council funded residency at Vermont Studio Center. Packing the car for less than a month of residency here in northern Vermont. It was a two day drive and now it’s two days into the residency. I did dive into work once I got here. Anthotype work. Now two are outside and a third will join them tomorrow morning. In a previous life I was a monk sequestered in a solitary cell. Maybe I was a lonely groundhog. That’s my studio practice. Twelve hour days with breaks for meals and artist talks in between. A walk here. A talk there. Tonight’s lecture was by environmental artist Jackie Brookner who’s work is concerned with the misperception of water as an unlimited resource. To get the mid-summer ball rolling, here’s a pic from tonight’s walk near Johnson Community College. Finally there is a sign of progress in regards to printing on Tosa Washi. I completely revamped my approach to making negatives by designing a QTR printer profile. Despite the recent push to use matte black ink for inkjet negatives, I have stuck with the glossy black strictly because of the expense of swapping out black ink on the Epson 4800. It seems to block plenty of UV. The dried down prints show no sign of a change in Dmax in the ground which can accompany the dark ground where the edge of the transparency lies. Here’s a brief workflow for handling the paper, without illustrations. At some point I will include an entry with pictures but I am short on time which will make sense in a couple of days. 1. I use a 3 inch wide synthetic bristle brush, which gets primed with distilled water prior to coating. I run the brush against the sides of the distilled water dish to discharge as much of the distilled water as possible. 2. The paper is placed on a piece of felt. I am using an 11 x 14 inch size piece for paper that is about 9″ x 12″. I use two strips of poplar weighted down with a stainless steel straight edge and a large wrench. These go to the left and right edges of the paper to keep it from moving during coating. I coat on the smooth side of the paper. 3. I brush initially in one direction from left to right, dipping the brush into the palladium / ferric oxalate mix for each pass. After creating four rows, I build up emulsion on the right side by starting at the bottom and brushing in one direction upwards. The action of the brushing goes from fast to slow. Fast at the start of a row or column and slower as you get to the other side. I use about 80 drop total for the 9″ x 12″ size paper. 4. I hang the paper on a clothesline, allowing it to air dry for thirty minutes. 5. I lay a sheet of card stock weight paper on the felt of spring back of the print frame. 6. Next comes the coated sheet emulsion up. 7. I use a sheet of clear mylar as a barrier between the negative and the coated paper. The paper has a lot of emulsion on it. 8. The negative is placed upon the mylar and the split back is assemble together. 9. Exposures have been running around 60 minutes to 90 minutes in a BL fluorescent exposure unit. I do use a Stouffer’s step tablet and expose to just barely make out the distinction between step 7 and 8. 10. It is very hard to gauge exposure so I recommend smaller coated pieces of paper as test strips. 11. I use a piece of Plexiglass that is slightly smaller than the tray but larger than the print to transport it between trays. 12. Always, always, always have chemistry in the tray before placing the print into the tray. The only modification to this is developer. I place the print into a tray with the Plexiglass with 80 percent of the developer. Once the paper has absorbed the developer from the reverse side, I pour the remaining developer onto the surface. 13. The paper is strong but prone to damage towards the end of clearing. I place the plexi and print into a slightly tilted tray with running water. The water strikes the tray in the upper left corner and monitor the print for five minutes taking care that the print does not roll up on itself or travel underneath the running water. 14. The washed print is transported on the plexiglass to a table. I place a piece of blotter paper on top and lightly brayer the blotter paper. I then peel off the print from the Plexiglass and transfer it to a clean drying screen. The prints have a bit of texture from the drying process and will need to be smoothed out with a clothes iron or dry mount press. Experiment with overexposed / underexposed prints. There lies in front of me a daunting task. Within this lies many little, yet no less daunting, tasks. 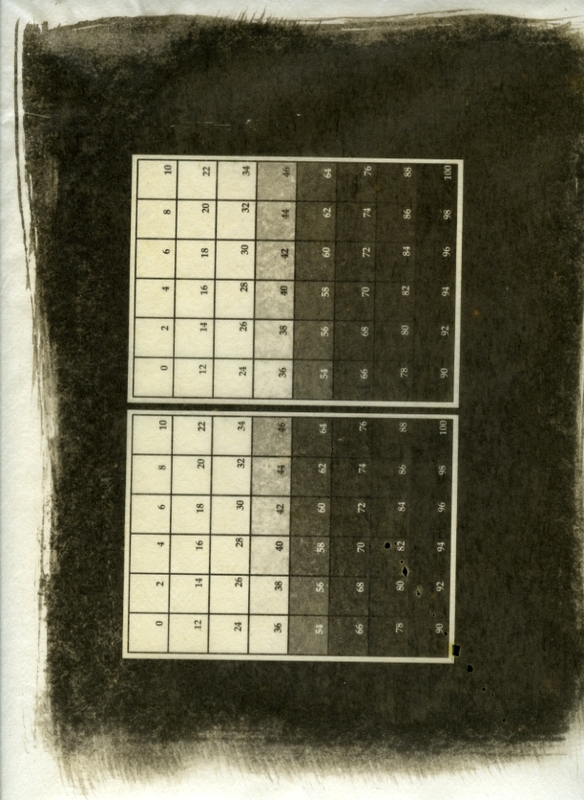 This challenge is printing historical process photographs on a new paper that is whisper thin. Thirty grams per square meter thin Tosa Washi made specifically for a show in Inno Town, Japan. I have investigated dosa as a well to make the paper respond well to various emulsions yet just as I was experiencing success, I read about the archival (acidic) issues with this method. After watching a video by the master platinum printer Nishimaru san who created this paper, I accepted the challenge of working with this paper as it is. Several things that he has incorporated into his process have obvious advantages. The bamboo rod he uses to transport the paper from tray to tray. I am opting for a sheet of clear acrylic but would love to try this at some point. I have access to bamboo skewers in the kitchen. Charging of the brush with distilled water is one of the most sensible things I have done. This prevents the brush from soaking up all the chemistry before it can be applied to a very thirsty paper. So glad I did this right away instead of wasting paper and chemistry with a dry brush. It could have been an expensive “DERP!” moment. I will have to stock more distilled water in the work area. Perhaps the most amazing thing I discovered from the video was the use of felt underneath the paper. This prevents the paper from creasing as brush pressure is applied to the surface of the washi. It also creates a bit of friction with two pieces of poplar at the left and right edges so that the paper stays put. Although the paper is designed to be used with the traditional platinum and palladium printing process, I have decided to try a Ziatype emulsion on it. Zia is a less expensive way of using palladium to form an image and it prints out an image. That means less calculation to determine proper exposure and no developer which means one less tray for a paper that is very prone to tearing and fraying in water. I also have a bit of Ziatype chemistry left over from a previous project. Below is my text target from which I will generate a curve for the Ziatype on this the Tosa Washi. I will still create palladium prints on this paper. That is Plan A. The Ziatype will be Plan B in case I am running low on Palladium chemistry and a very finite supply of paper.